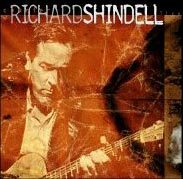 Richard Shindell, a singer-songwriter who has built a solid fan-base through constant touring, has released his first live album. Recorded in three different venues on four different nights over a six-month period of 2001, the album has surprising continuity. A great deal of attention was paid to giving this album a cohesive sound. The musicians include the fine rhythm section of Denny McDermott on drums and Lincoln Schleifer on bass, with usual suspects Rad Lorcovic on accordion and Larry Campbell on violin. He is also backed by Whirligig members Greg Anderson on bouzouki, cittern and guitar and Lisa Gutkin on violin. Lucy Kaplansky, inevitably, provides vocal harmonies. Oddly, the material on this album comes mostly from his first three records, with only one song from the album he was touring at the time, Somewhere Near Paterson. It is somewhat of a surprise to hear Shindell with a band. I have seen him solo several times, in pubs, halls and at festivals, and I've always preferred the stripped down renditions of his songs to the studio versions. His guitar picking is a band in itself, subtly supplying bass, rhythm and melody. Shindell's vocals in this setting are always a source of fascination for me. I have tried to sing some of his songs, and I almost always need to listen to the songs again to figure out how he drapes the lyric over the melody and chord changes. His timing is unusual, unexpectedly drawing out a phrase, coming in slightly off the beat. When he plays solo or lightly accompanied Shindell is free to explore the emotions of the lyrics and the sounds of the words. For most of the album, the band takes a supporting role, letting Shindell set the pace and mood. "Next Best Western" sounds as good here as it ever has, with Kaplansky's harmony vocals taking the song to another level. "Reunion Hill," which received a grandiose treatment by Joan Baez as well as on Shindell's own studio version, gets a reflective reading here to violin accompaniment that reminds me of Jay Ungar's work for the PBS series "The Civil War." It just may be the definitive version of the song. "Nora" gets a similarly deft treatment with some wonderfully restrained atmospheric accompaniment on electric guitar. I have been unsuccessfully requesting my favorite Shindell song, "On A Sea of Fleur-de-Lis" at concerts for years, and this beautiful version of the mysterious song has made the wait worthwhile. Shindell introduces Bruce Springsteen's "Fourth of July, Asbury Park (Sandy)" saying that it won't be on the record. Then with Kaplansky and company he proceeds to give me five minutes of goosebumps! It's obvious why he changed his mind! Richard Shindell is a native New Yorker who now lives in Argentina. The terrorist attacks of September 11, 2001 gratefully did not directly affect him or his family, but they certainly had an emotional impact. The following quote from the Young/Hunter web page describes Shindell's fund-raising effort in the form of an MP3 of a song he wrote in response to the attacks. "To raise funds for WNYC, we are making an MP3 of my new song "I Am" available for a minimum donation of $5. Of course, you may contribute more if you wish (simply state how much you'd like to donate in the "Special Instructions" section of the order form). All proceeds will go directly to the station. We have chosen this organization not just because of its great need but because of its commitment to balanced debate. In the context of the current crisis, it seems to us that the widest possible reach of programs such as On the Line (with Brian Lehrer), New York & Co. (with Leonard Lopate), The World, and All Things Considered are more vital than ever. Thank you so much for your support." True to form, this is one heck of a good song. Click here to find out more about this worthy effort.